Like you, I have noticed the commercial Christmas paraphernalia encroaching ever since Melbourne Cup Day. It happens every year, of course, but the crassness of it all always leaves me squirming – I hate it. But there’s another side to the abuse of Christmas, too. I’m sure some of you have become aware of it. Churches do it. Christmas magazines and media do it, too. It’s everywhere – and often Christians fall right into it because we have been conditioned into it most of our lives, and our surrounding culture cooperates. We need to be careful not to airbrush the Christmas story. The temptation is to make the story so cosy and sweet – almost like a fairy tale. But it was anything but. The arrival of the Messiah into the crudest, rudest and austere of circumstances was dangerous. The reigning puppet king, Herod, sends out horsemen to find him and kill him. For Mary and Joseph, too, it was difficult, stressful and awkward. They are alone in very impoverished circumstances, far from their home village where the gossip about Mary was at fever pitch. This baby was sent to die for the sins of the world. It’s not a pretty story, not a romantic movie-type narrative. No. But it is a beautiful, dangerous story, an amazing story, an awesome, wonderful story of the determination of a loving God who unswervingly orchestrates and implements his salvation plan for all humanity. It is so easy to avoid these parts of the Christmas story because it might scare or offend people, but as it is part of the holy Word of God, it is important to address. Christmas is about a week away by the time you read this. May I encourage you to slow down – slow right down – find a solitary space, and read through Matthew’s Christmas narrative, and take in the unsanitised, unairbrushed story … and let the enormity of it all, the danger of it all, the beauty of the costliness of it all, the wonder of it all and the sheer audacity of it all soak deep into your soul, as light began to shine in the darkness … then come and give thanks to God, and adore the Christ. 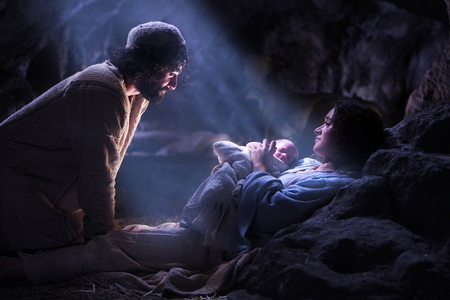 May you experience the joy of Christmas this year as you meditate on the greatest story ever told.